Veritas is renewing its assault on Data Domain and the disk/cloud archive market, Nutanix has offered $3,000 rebates to resellers of a Dell XC Core product, and flash memory researchers are looking at 128-layer 3D NAND. 96-layer flash isn't even a thing yet, but boffins always have to look ahead. Today we get to take a look with them. The flash industry is delivering 64-layer 3D NAND, while sampling and trying to productise the next step forward, 96-layer 3D NAND, with a notional 50 per cent capacity jump. Industry analysis outfit LAM Research is looking further ahead and has 128-layer 3D NAND in its sights. According to Wells Fargo senior analyst Aaron Rakers, Western Digital started sampling 96-layer product late last year but significant production is not expected until the second half of this year. Rakers' industry checks suggest Toshiba/Western Digital could still use a single-stack architecture at 128-Layer 3D NAND rather than a string-stacking one. Dell EMC total storage revenues by quarter 2009-2017. 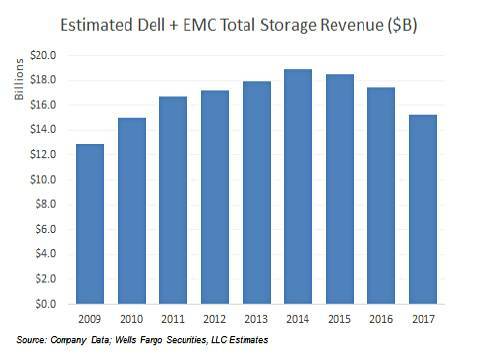 Dell EMC total annual storage revenues 2009-2017. This revenue decline would help explain Dell's executive-level focus on growing storage revenues. 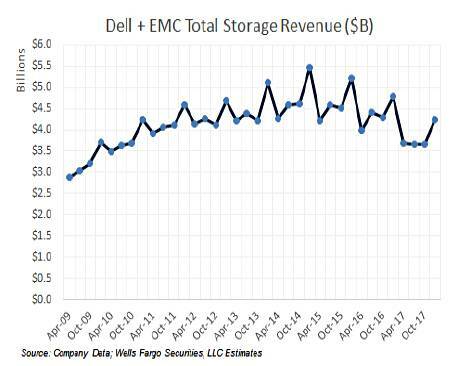 He notes Dell reporting that its overall storage demand (revenue and deferred revenue) in its fourth fiscal 2018 quarter (ending January 31) increased year-over-year for the first time since the close of the Dell EMC transaction in the October 2016 quarter. There was strong growth in its storage deferred revenue in FY2018 driven by new storage delivery models (such as consumption-based). 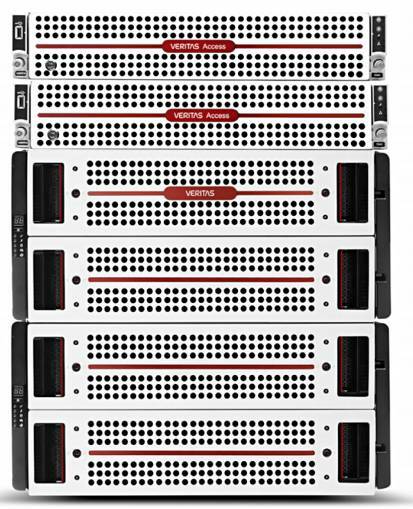 Kaminario has integrated its Composable Data Platform (formerly known as the K2 all-flash array) and its native snaps with Commvault's IntelliSnap snapshot technology to automate application-consistent data protection and copy data management workflows. The two say they deliver an integrated, automated data protection approach that provides a single, complete view of all stored data. Nutanix OEMs its HCI software to Dell EMC, which sells it in its XC appliances alongside its own VSAN-based VxRail appliances. There are new channel programme incentives and expanded standalone software licence offerings with Dell EMC from Nutanix. Specifically there is an XC Core offering, which includes PowerEdge 14th-generation servers and Dell EMC solution integration software. It's an alternative to other XC products to let customers purchase the Nutanix software licence separately from the rest of the appliance, with access to software support directly from Nutanix. Dan McConnell, VP hyperconverged infrastructure at Dell EMC, said: "As Nutanix expands its sales model to sell standalone software licenses, the Dell EMC XC Family, based on Dell EMC PowerEdge 14th generation servers that are designed for hyperconverged infrastructure, is the perfect match for any Nutanix deployment. Dell EMC XC Core offers an additional way to adopt Dell EMC and Nutanix technologies as customers continue to show strong interest in the XC Family as the best approach to deliver and support Nutanix-powered hyperconverged appliances." Cloud storage gateway and file sharer Panzura is offering Private Secure Site Mode – an installation with security restrictions that require absolutely no external communications. It says this provides customers with total control over their stored data without risk of outside monitoring or attack. Panzura quotes Scott Sinclair, senior analyst at Enterprise Strategy Group: "The ability to manage, store, backup, and recover data in a private environment while ensuring no communication with any public service or IP address is extremely valuable for government and heavily regulated industries." Rich Weber, chief product officer of Panzura, said Private Secure Site Mode essentially implements an internal firewall that will ensure compliance with the toughest security requirements. Private Secure Site Mode is available now on Panzura Freedom 7.1 and is standard at no additional cost. The Nikkei Asian Review reports that WDC will invest $4.68bn (¥500bn) in its flash joint venture with Toshiba between now and 2021. The cash will help pay for clean room equipment in Fab 6 at the Yokkaichi plant in Mie Prefecture and a new plant in Kitakami, Iwate Prefecture, set to open in 2020. Both will build 3D NAND memory chips. This is a sign that WDC and Toshiba are moving on after the near year-long spat over the Toshiba Memory Business's sale of its interest in the JV to a Bain Capital-led consortium. Approval of that deal by the Chinese anti-trust regulator is taking longer than hoped and approval is now expected between April and June. Toshiba is in better financial shape now, having raised ¥600bn in December from issuing new shares to overseas funds. This should enable it to avoid Tokyo Stock Exchange delisting. It has a new chairman and CEO, Nobuaki Kurumatani, 60, who takes up the posts in April. He currently heads the Japanese arm of private equity firm CVC Capital Partners and was at Sumitomo Mitsui Financial Group (SMFG), which lent money to Toshiba. The incumbent CEO, Satoshi Tsunakawa, downgrades to COO but will remain Toshiba president. Booming demand for flash and a good price regime has seen annual operating profits rise at the Toshiba Memory Business to ¥450bn. The overall Toshiba Group has no other annual operating profits, with its flash biz being the undisputed profit-generating jewel in its crown. Veritas is taking on Data Domain with renewed vigour. It has two new turnkey appliances – Flex and Access – with a focus on healthcare but not limited to that. The Flex 5340 Appliance, an upgrade of the 5240 Backup Appliance, is built with microservices, and uses NetBackup and NetBackup CloudCatalyst (PDF), with its transfer-to-the-cloud deduplication capability. Its datasheet says that a single Flex 5340 Appliance enables on-demand deployment and easy configuration of multiple NetBackup and NetBackup CloudCatalyst configurations. There can be a maximum of six Flex Appliance data protection instances of the NetBackup master server, media server, and media server as NetBackup CloudCatalyst. Veritas says consolidating multiple NetBackup and NetBackup CloudCatalyst deployments on a Flex Appliance drastically reduces the number of server and storage devices needed. It can send data for long-term retention to the Access 3340 Appliance and public clouds. The Access 3340 Appliance is aimed at tape archive replacement. It's based on Veritas's scale-out NAS software, integrated, like the Flex Appliance, with NetBackup and NetBackup CloudCatalyst. It delivers, Veritas says, on-demand, enterprise-wide backup and recovery, long-term retention and cloud tiering. Veritas has been in the scale-out NAS area for some time, having a FileStore N8300 product, built with Huawei hardware, back in 2011. The Access 3340 supports Amazon S3, CIFS, NFS, SMB for file and object access, and iSCSI target support for block storage. Policy-based tiering orchestrates automated data migration to on-premises stores and public clouds. Users can have multiple NetBackup domains in a single appliance. The appliance is offered on a pay-as-you-grow model that starts at 700TB of usable capacity and scales to 2.8PB. It comes with two server nodes and one to four storage shelves. 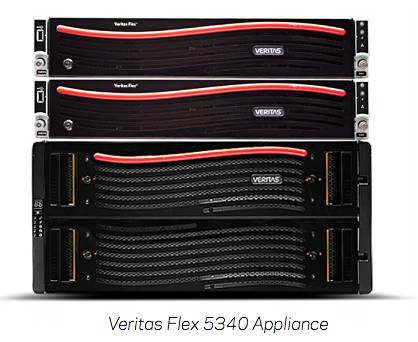 Veritas Access 3340 Appliance - no common design language with the Flex 5340 Appliance. The Access Appliance is available now and the Flex Appliance arrives next quarter. Cloud storage company Wasabi and Cloud Constellation Corporation (CCC) are collaborating to deliver cloud data storage and security services from space. CCC uses a constellation of 12 satellites in low-earth orbit (LEO) that are networked with a laser photonic ring. This network communicates with secure access points located at Wasabi data centres and enterprise customer sites via connectivity with geosynchronous satellites. Wasabi is AWS S3 bit-compatible, and costs a flat $.0039/GB/Month with a 1TB minimum usage. It also offers immutable buckets. Archive360 has launched its Microsoft Azure-based, long-term archive for medical DICOM images. Using the Archive2Azure product, medical organisations and professionals can automatically move ageing DICOM images to the Azure cloud platform. Acronis has announced a strategic partnership with Google Cloud, revealing plans to integrate Acronis backup products with the Google Cloud Platform. It will increase the number of cloud regions where Acronis's partners and customers can store their data and bring fast uploads and data sovereignty options to users in a greater number of countries. Google Cloud Platform will be integrated into future releases of Acronis's backup, disaster recovery, and file sync and share products. Backblaze is reducing the price of Backblaze B2 Cloud Storage downloads by 50 per cent, with B2 download pricing dropping from $0.02 to $0.01 per GB. The first gigabyte of data downloaded each day remains free. CTERA Networks, which supplies secure enterprise file services, announced record results for fiscal year 2017, more than doubling its enterprise software subscription revenue year-over-year. It says it has added McDonald's and new commands within the US Department of Defense as customers, and also expanded implementations at numerous tier-1 financial services firms and leading service providers. Irish independent commercial broadcaster TV3 has bought 1PB of Object Matrix storage for content governance and instant access to all its content in the archive. Unitrends announced expanded cloud backup offerings for Microsoft Office 365, Google G Suite, and Salesforce through a new technology partnership with Spanning Cloud Apps. Spanning Backup for Office 365 is available from Unitrends today with Spanning Backup for Salesforce and Spanning Backup for G Suite to be released later in 2018. A free trial is available here.